Calling either problem a “crisis” is, of course, journalistic hyperbole intended to dramatize situations that are likely to bump along deleteriously, but not quite self-destructively, for years. …we unexpectedly observed a social judgment bias favoring blacks over whites. In 5 subsequent studies, we established that this effect is robust, replicable, and appears to occur partly outside of awareness and control. The latter part of Nosek’s findings””outside of awareness and control””is important within the academic world because in recent years a party line has developed that white racism works on autopilot outside the conscious willpower. Since few whites will admit these days to believing that blacks and whites tend to behave differently on average, the rationalization has emerged that white racism is such a powerful mind-warping force that it works its evil whiles outside of human control. The academic mainstream assumes that white racism operates much like the CIA mind-control beams that crazy people pick up via their dental fillings. But Nosek’s original study and his five follow-up studies found the opposite. White people of all political persuasions tend to bestow honors upon blacks even when they are less deserving than whites. In a half-dozen studies, with a total sample size of 4,359 white people, whites consistently rewarded blacks for meeting lower standards. 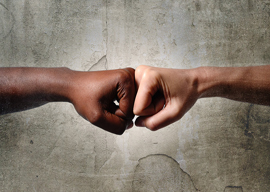 Participants, regardless of their explicit attitudes or political beliefs, appeared mostly unaware that they may have been comparing black applicants to a subjectively different standard than white applicants. Strong liberals were the most bigoted against whites. Moderate conservatives were the least antiwhite, but even they were still biased against their own race. And strong conservatives were even more discriminatory against whites than moderate conservatives. The fact that the pro-Black bias occurred even among those participants who simultaneously opposed affirmative action, wanted to be unbiased, and believed they were so is further evidence that the racial difference in criterion bias [i.e., antiwhite discrimination] can occur without intention or awareness. Why do whites give blacks more honors than they deserve? As soon as the words left his mouth, the Mayor regretted them. He knew what his tiny assistant would say. It was inevitable, and so he braced himself for the vile phrase, and sure enough, here it came. “Mainly plaques for blacks,” said Sheldon…. This doesn”t mean, however, that whites are more likely to hire blacks for routine jobs than they are to hire, say, Mexicans. For example, while the Academy of Motion Pictures nominates lots of blacks, it hasn”t nominated an American-born Latino for an acting Oscar in over 20 years. And yet, Academy members hire far more Latinos than blacks to clean their houses and look after their children. Nosek and company gave their subjects the celebrated implicit attitude tests, which have become popular for witch-sniffing racism. Subjects are shown pictures of whites and blacks along with positive and negative words, and the number of milliseconds necessary to respond is deemed evidence of racist guilt. Here, the pro-black behavior was in the opposite direction of participants” pro-white attitudes, and most participants (77.3%) did not report any conscious effort of altering their behavior to favor one race over another. From this perspective, the results are enigmatic. Based on existing theories of attitudes, it is difficult to explain how a pro-black behavior emerged that ran contrary to explicit and implicit attitudes, and, for most participants, did not appear to be a result of consciously altering behavior so as to favor blacks. But should pro-black bias be all that “enigmatic” to social scientists? This pro-black prejudice is hardly surprising in a culture that treats thinking well of blacks as the highest moral value. America repeatedly gins up moral panics and two-minutes-hates over individuals who are revealed to privately hold thoughts skeptical of the racial orthodoxy. For example, in 2014 President Obama took time during a ceremonial press conference with a foreign leader to denounce Donald Sterling, owner of the Los Angeles Clippers, for what the jealous old fool had said to his part-black gold-digging mistress in private. Sterling was subsequently forced to sell his property against his will. But there’s evidence that the pro-black biases of Americans whites aren”t simply due to force majeure.